I feel so honored to be chosen by Michael’s to tell you about their new yarn line! Because they are such a great company I didn’t have to think twice about saying YES! And I was even more thrilled when the yarn came for me to play with. They also know I have both knit and crochet fans so I get to show you projects in both crafts and everyone wins! 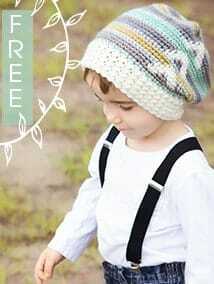 Here is my first FREE pattern as part of a 5 month campaign to bring you Loops & Threads Colorwheel awesomeness. Want to know if your local store is one of the 800 U.S. or Canada stores carrying Colorwheel yarn? CLICK HERE to go to the store locator and give your local store a call. It’s Soft! For real! I think sometimes I hear acrylic and I think scratchy but Colorwheel will not disappoint! 54 Color Choices!! I mean WOW! They can be combined to do gradient work or little pops of color here and there. $1.99/skein which is an amazing price point! No more spending a fortune because you want lots of colors for fun projects! •Coffee Cozy will be worked flat and then seamed. Repeat rows 1-4 of Main Body until desired length. For coffee cozy repeat rows 1-4 of main body for 4 total times using Alternate Color Mid Pink; repeat 1 more time using Alternate Color Bright Gold; repeat 4 times using Alternate Color Light Blue. For finishing row repeat row 1 while also binding off. Fasten off leaving a long tail to seam coffee cozy. •When joining, join to the first stitch of the round. •Chain at the beginning of the round does not count as a stitch. Ch1, *skip 1, 2sc in next; repeat * around, join to first sc in round. With Alternate Color, Ch 1, slide hook under the second strand of the ‘V’ in the second stitch from the row below and then 2sc into the skipped stitch from round 2; repeat * around. For the last stitch in the round the 2sc will be worked over the seam and into the first skipped stitch, join. Repeat round 3 alternating between main colors and alternate color every other round until desired length is achieved. For this coffee cozy there are 4 rounds of alternate color Mid Pink, then 1 round of alternate color Bright Gold, then 4 round of alternate color Light Blue. The Cozy ends on a Main Color round. A big thank you to Michael’s for inviting me to blog about this wonderful new yarn line with you. 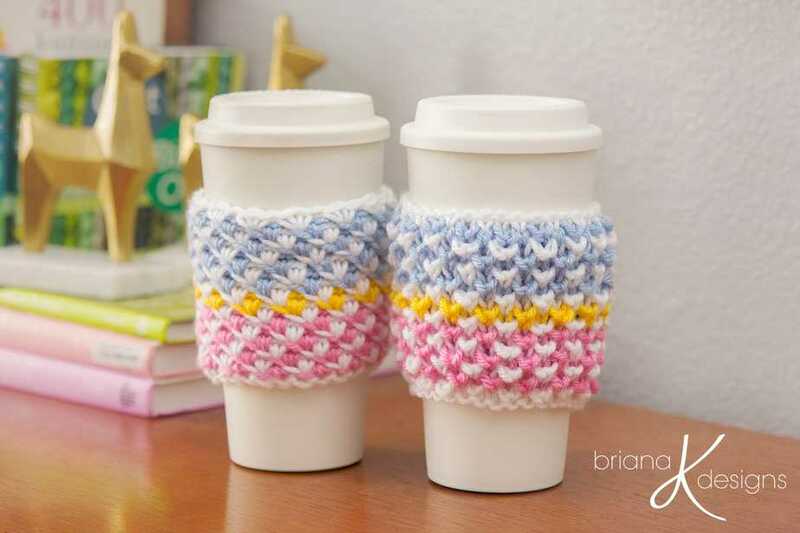 Sign up for the Briana K Newsletter for more fun, patterns, and product reviews. Love this project and stitch. Is there a way to do the crochet Bee stitch flat for a blanket or scarf? I also would love a written pattern in crochet for an afghan in the Bee stitch. It’s beautiful. Can you show us how to work this stitch flat for a blanket? It’s beautiful!!! I love this new stitch thank you . Is there a pattern to do the crochet Bee stitch flat for a blanket or scarf? If working in rows instead of rounds, do you just ch 1 and start immediately into the Bee Stitch?